I’ve gotten over the shock of having short hair now (amazing what a week does!) and I have gotten used to it to seeing it short. It still feels weird because I keep reaching for hair that’s just not there anymore, guess I’m just used to having long, long hair! But it’s a nice change (or maybe I’ve just forced myself to adapt to to change). Work for the last week has been busy, gotten a lot of work done while trying to keep sane. Keeping sane involves a lot of tea drinking and I keep having late lunches – I don’t like that one bit. But such is life and the sacrifices made for work… I get a little testy when I haven’t had food for a while, so I’ve been bringing lots of little snacks to have throughout the day. Apparently hearing me munch of on apple slices is distraction (but then, it’s probably more acceptable than me snapping at people so I ignore the fact that people find me munching on apple slices to be distraction). On Saturday I spent a lot of time in stores, heh. I went to two thrift stores and got some things… At the first store, I got a vintage queen-sized pillowcase with absolutely no wear to the fabric or to the tag (score!) at $1.99. 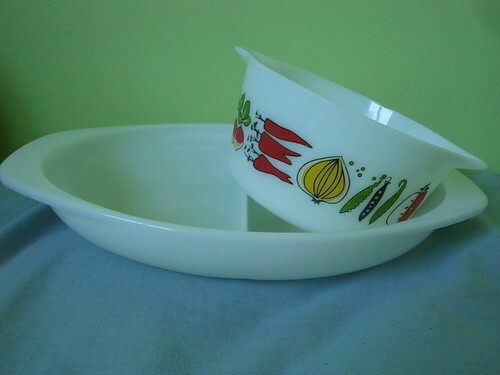 Then there was two pieces of pretty Pyrex. White divided serving dish was $2.99, JaJ ‘Harvest’ casserole dish was $3.99 (missing lid but the pattern is in amazing shape and I should be able to find one for a dollar though). 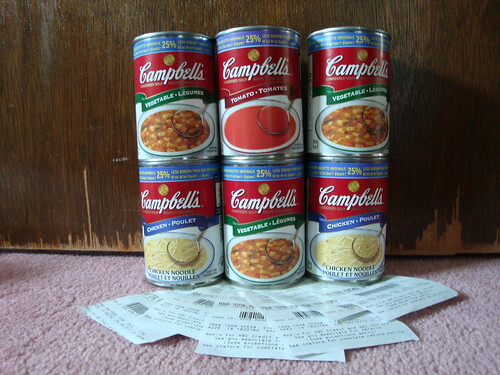 My sister D and I had also gone into Zellers because they have Campbell’s soup on sale at $0.54 and she had 6 coupons (yes, 6 – her condo gets newspapers delivered twice a week, they’re put in the lobby and whoever wants them can snag them. She snags some of the extra inserts only if there are good deals and if there are papers left over the night before the next delivery date.) for them, making it $0.04 a can. Zellers has it in their coupon policy that the phrase “one coupon per purchase” means “one coupon per transaction”. All other stores that my sister and I had ever shopped at took “one coupon per purchase” to mean “one coupon per item” as a purchase is for an item and a transaction is for all the items. But the cashier was quite snippy and was all “You can only use one coupon per transaction it says so in our coupon policy” (but she couldn’t actually show us the coupon policy – I looked it up later and it was true that they’re kind of whacked with their definitions). So my sister just smiled at her and said that she could ring them up. Individually. And we didn’t even have to wait in line 6 times either. So six cans, six receipts. $0.04 per receipt. It would have been a lot easier if she would have just rang them all up together (and would have saved paper too). Today (Sunday), I headed out to see the local dolly enthusiasts! It was such fun, I got to do a little bit of shopping first at this great store in the mall and then we hung around the food court. Some of the security guards were a little concerned about us being there (did we get permission, why did we need three tables?) but one of the ladies I was with explained to them that we were shopping at the mall and eating at the mall and we had about 3-4 people per table – much like the other similar-sized tables in the food court and we weren’t be loud/disruptive and hadn’t had any complaints from other mall patrons, so they left us alone for most of the time after that. It was fun though, getting to see people again and there were new people (yay!) that I hadn’t met in person before so it was neat getting to meet new people and their dolls. I always love looking at your pics of your finds when your out n about! I love the books..even though I cant knit!!! i think 4 cent a can is awesome too! I swear coupon policies can be whatever the person wants them to be at the time..my mom always prints the stores’ ones off before she goes ..
and oh my look at the dolls! That’s awesome! 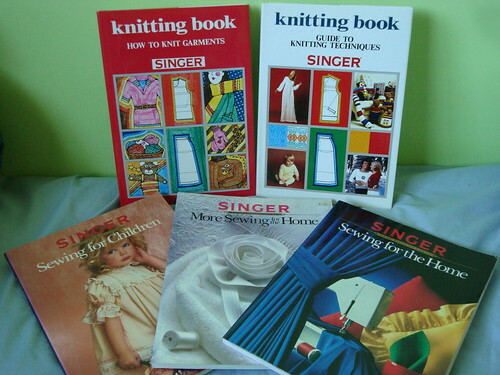 I want those Sewing books. I’ve always liked sewing and one christmas a couple years ago my mom bought me a Sewing Machine. I feel in love and guess what she told me, “You can take it back and get something else if you wish.” I said heck no, Thanks! I want to get some of those Sewing books and learn more tips and techniques! Yeah, coupon policies are crazy but hey! you got 6 cans for .04$ can’t beat that! Even if you had to get them rung up separately!